« Bike Month is Coming – thanks to many businesses for generous donations!! Looks great! Excited to start coming to some meetings to participate! I don’t understand why the route encourages sidewalk riding on that section of San Pablo – it’s terrible. Much easier to turn into the village at the signal off Buchanan and then ride up to the bike path next to Habit. Drivers in the Village aren’t going fast and there are plenty of stop signs. Very safe. The sidewalk is a bad idea. Thank you Lin. It is indeed a bit hard to portray the situation on a map at this scale. The section of sidewalk recommended for riding is between Village Creek (just north of Sprouts) and the southwest corner of Marin and San Pablo. There is no cycling path making this connection currently. CalTrans, recognizing that some people would likely ride the wrong way on San Pablo from the north end of the cycletrack by Sprouts, approved the cycletrack on the condition Albany make riding that sidewalk segment legal to reduce the likelihood of people riding the wrong way. I have not checked if Albany has done so, but if not it is violating the agreement with CalTrans as I understand it. Last Monday, the Council adopted an update to the City’s five year Capital Improvement Plan. 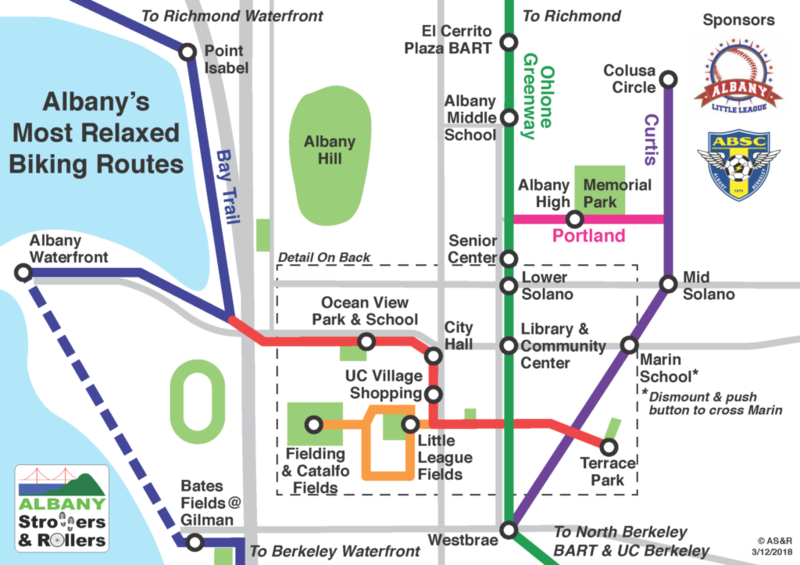 This update includes a project to extend the cycletrack from Village Creek to Marin so it connects to the east end of the Buchanan path. This is listed in the Plan as a currently unfunded project. There are a number of grant sources that could pay for it (less any required local match, which is typically 10% to 20% of the project cost). This grant application would presumably compete well because it closes a short gap and is part of a marquee project (CalTrans is touting it approval of the San Pablo cycletrack as a first). AS&R is encouraging city staff to apply for a grant from the state’s Active Transportation Program cycle 4 funds, which will disburse over $400 million over the next few years. AS&R has not heard back from staff affirmatively that it will do so. 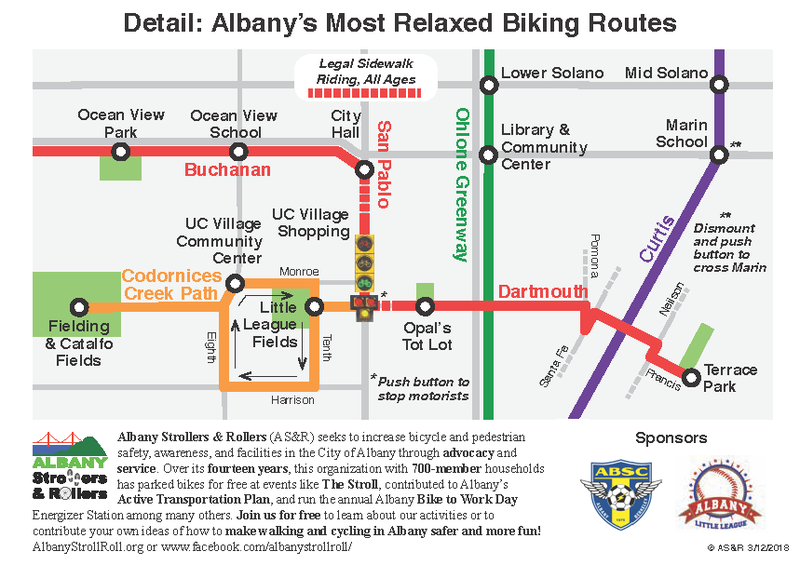 You can write citycouncil@albanyca.org if you would like to encourage Council to direct (and staff to proceed with) preparation and submittal of grant applications to improve this key link in Albany’s most relaxed cycling network.